Johnny Clockworks, a member of the Stamp Stampede, performs a song he composed about campaign finance reform at a recent event for Sen. Bernie Sanders. The Stampede is one of many advocacy groups vying for attention in the shadow of the N.H. primary. If you’ve got an issue -- a single issue -- you want to bring to the nation’s attention, there’s no better place to be right now than New Hampshire. The state's position as host of the first presidential primary gives enterprising advocates a chance to seize the attention of would-be White House occupants. 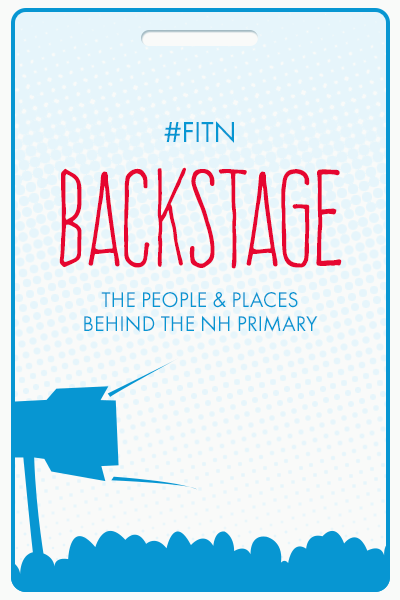 But the issues now jockeying for position seem to be proliferating, and advocates' tactics often undercut the image of New Hampshire as a bastion of spontaneous encounters between candidates and ordinary voters. 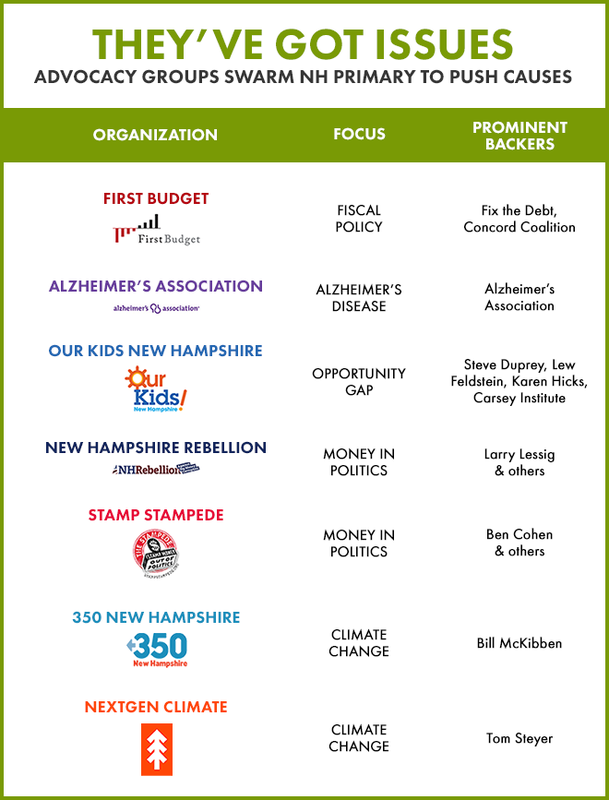 And there's the campaign finance reform effort, the New Hampshire Rebellion. 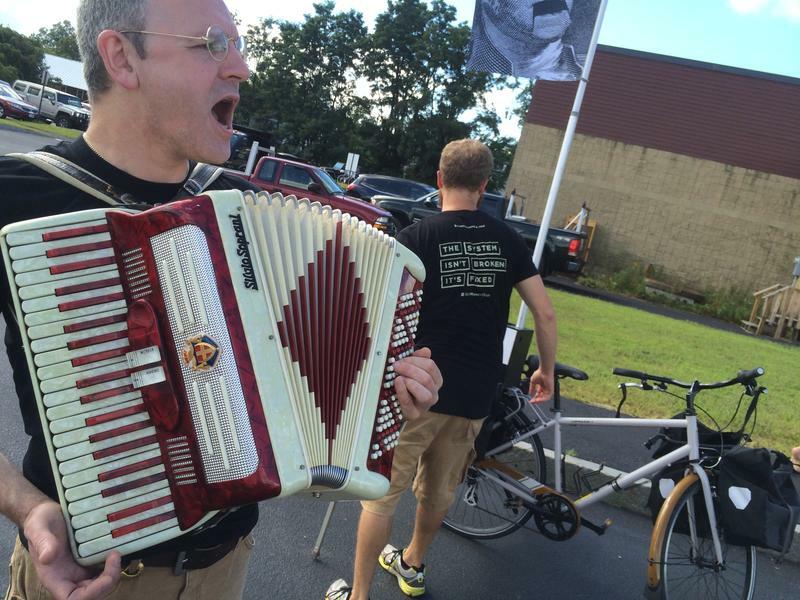 And, of course, there's the Stamp Stampede, another campaign finance reform effort, some of whose members have been known to serenade presidential candidates while playing the accordion. These and other groups are thick on the ground in New Hampshire this year for a simple reason: It's where the action is. At campaign town-hall meetings these days, for every member of the public who just genuinely has a question to ask there seem to be two people with an agenda. At a recent event, Brenda Bouchard of Madbury stood to ask Wisconsin Gov. Scott Walker about Alzheimer’s disease. Her question was nearly a minute long and packed full of facts. Among advocacy groups, this technique is called "bird-dogging": The questions are well-rehearsed, crisply delivered, and point the candidate toward a desired answer. Groups offer trainings for how to do this well, and have talking points and scripts on their websites. For these folks, the campaign trail is a stage to get a pet issue front and center. And it's in stark contrast with the New Hampshire Primary of myth, where individual voters confront candidates one-on-one, with no agenda other than their own. And if bird-dogging alone doesn’t work, you can try what college climate activists with 350 New Hampshire did at a Hillary Clinton campaign stop in July: You can heckle. “Well now wait, wait,” said Clinton as a group of students began chanting “Act on climate!” in response to a question about fossil fuel donations to her campaign. The chants died down very quickly, and a banner unfurled by student activists was soon obscured as the crowd gave a standing ovation to Clinton. But for one news cycle, everyone was talking about Clinton and climate. But do these tactics lead to policy changes? It’s a complicated question to answer. But if you were to point to one success, it might be the campaign to make healthcare reform a major issue in the 2004 primary campaign. Brian Hawkins, a union organizer in New Hampshire, was part of that push, which turned out people wearing their trademark purple shirts, asking about healthcare to every campaign event on the calendar. 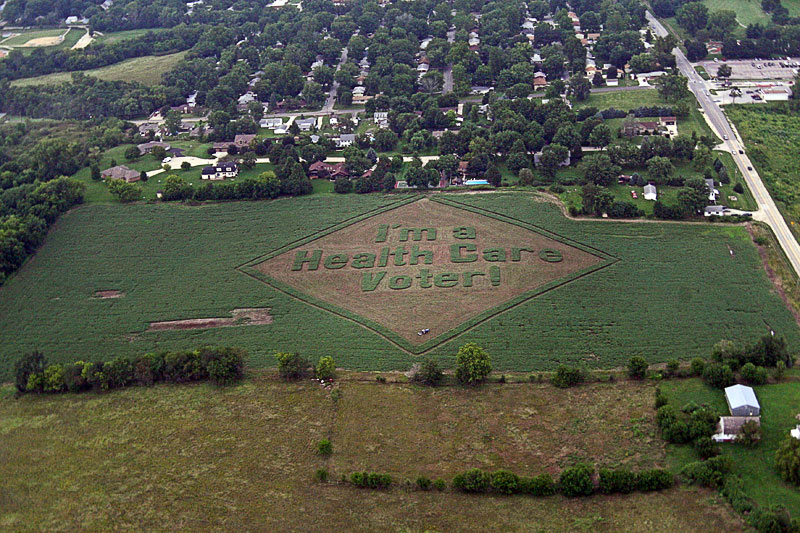 In 2004 the SEIU's campaign mowed this message into a corn field near a major airport in Iowa, so candidates would see it as they flew into the state. This 2004 campaign was paid for by a major national labor union, the SEIU, which had the wherewithal to carry through with the campaign as the primary wore on. But in New Hampshire it began with asking towns to pass resolutions in favor of quality healthcare in town-meetings, and signing up more than 50,000 New Hampshire residents in a pro-healthcare-reform petition. A lot of these campaigns are using the same tactics as the ‘I’m a Healthcare Voter’ campaign. But as the number of groups asking questions like these starts to proliferate, can they break through the noise? Redlawsk said candidates are starting to get savvier about filtering the questions they are taking at big public events to suit their existing platforms. He thinks these days a quieter approach might be more effective. “Virtually any candidate will talk to you right now, closed door in particular because they want to hear from you, but they hope to get you to say nice things about them," Redlawsk said. "That approach is going to be a heck of a lot more effective than a bunch of people standing around in T-shirts asking potentially hostile questions to get attention." 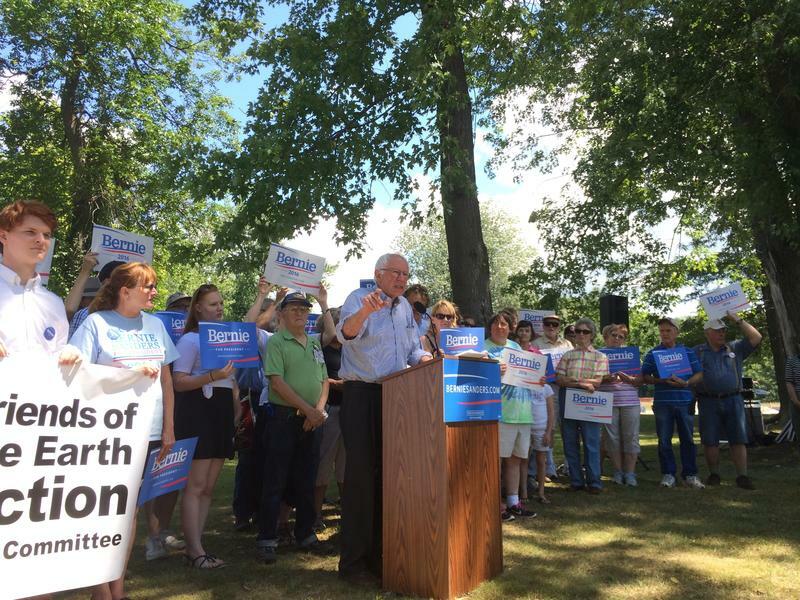 And lo-and-behold: There are groups doing just that in New Hampshire this year. A bipartisan group of local luminaries, called Our Kids New Hampshire, has been meeting privately with presidential candidates. The group is worried about the opportunity gap –the way race, wealth, and background combine to perpetuate inequities for certain kids. In stark contrast to the rabble-rousers at campaign town halls (such as representatives of the Stamp Stampede, who played the accordion and handed out stickers from the back of a bicycle at Bernie Sanders’ campaign events last week) members of the board of Our Kids declined to discuss on tape how the meetings have been going. But as the cottage industry of issue campaigns continues to blossom in New Hampshire, there’s likely room for every strategic approach. Where They Stand: On Environment, Democrats Vie to Be "Greener than the Next Green"
In this year’s Democratic primary, several candidates have made action on climate change a major part of their campaign. This time around they think it could be a winning issue for them in the general election, and they’re also more comfortable using it to draw distinctions between each other. Environmental Groups Pour Money Into N.H., But Can Climate Change Sway Voters? Environmental issues have never ranked high on the list of issues that drive most voters to the polls. But this year, Tom Steyer – a former hedge fund manager and billionaire – has pledged to spend $50 million dollars in a few key races around the country, hoping to make climate change a central issue. 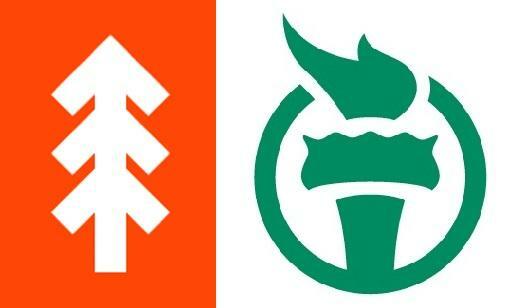 This spending begs a question: can talking about global warming actually win elections? Steyer’s operation in New Hampshire, NextGen Climate, has 24 full-time staff, and 5 field offices with two more slated to open in the coming weeks.